Dorm Decor Extraordinaire! – PopTalk! Take Your Dorm Decor From Drab to Fab! Moving in to a dorm at school is one of the most exciting, yet nerve-wracking endeavors of young adult life. This one room, often shared with another (sometimes a total stranger!) becomes your home away from home. This will be the spot where you come, exhausted, after a long day of learning, to study for your classes, where you wake up each morning, and get ready for every exciting day of your college life! Dorm rooms are classically stark, and come to you with heaps of rules, like no candles, no painting, no tacks or nails in the walls… they certainly don’t make it easy for you to make your room look enthralling! However, don’t get discouraged by the bleak, white walls and utilitarian furniture. Your dorm room can be a truly fabulous space, one that expresses your personal style, welcomes you after a long day, and encourages your creative energy! Here are some tips for fabulous dorm decor that will create sizzle without breaking the bank or getting your RA into a frenzy. You will need a lot of sleep. Your head is going to be spinning from all the compelling knowledge, cramming for exams, keeping your schedule straight, and getting to know so many new people! It is while you sleep that your brain is able to commit all of this to memory. So try to make your bed as welcoming as possible. Aside from those extra long twin sheets, get some cute throw pillows and fun printed blankets to add a splash of inviting color to the room. Also, to create a comforting nook, WallPops has fashionable room panels that can be hung from hooks to create a little privacy. You and your roomate may have different study schedules, so these panels can help to give you both a sense of personal space. An inspirational quote above your bed is also a nice touch! 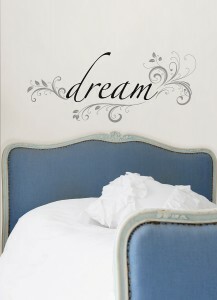 WallPops has sweet words for the wall like “Dream” and “Life is Beautiful“. Hit the books and set yourself up to succeed by being organized! Your dorm room will come with a desk so that you have a dedicated space to study. Consider getting a charming lamp to set the lighting just right and add a home-y touch. Have fun setting up your desk with cute cups for your pencils and pens, be prepared with a stapler, and create a fashionable and functional folder system for each class. And don’t stare at a blank wall! Peel and stick dry-erase decals won’t harm your colleges’ paint job, and provide a space to plan your schedule and leave yourself reminders. 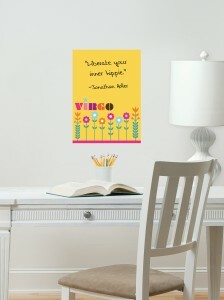 With designer dry-erase decals by Jonathan Adler, including zodiac sign wall art, message boards and calendars, WallPops will whip your desk into shipshape! 3. Don’t Forget the Walls! Don’t let dorm rules about nails and tacks in the walls discourage your designer diva dreams. WallPops are the perfect solution for your boring wall woes. Decorating your yawn inducing dorm walls will make the room pop. 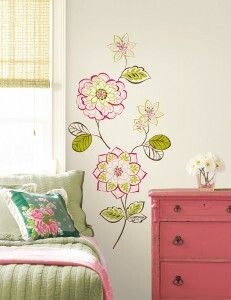 For a cool dorm room, pick peel and stick wall art that you can take with you at the end of the year. 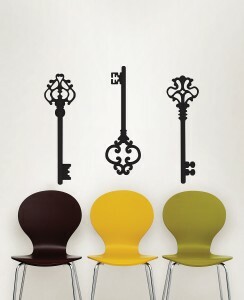 From zebra stripes to skeleton keys and wise owl graphics, we have dorm wall art for every style and taste. 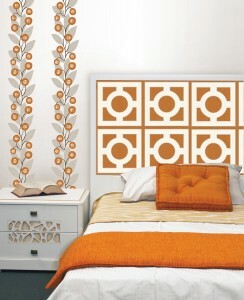 Check out our frame decals by Jonathan Adler. Choose from black and white frames with sassy silver accents, or chic colorful enamel frames. These frame decals make a peel and stick gallery so you can be surrounded by photos of your friends and family from home, magazine photos, artwork and anything else you find wall-worthy. Have fun making your dorm room the coolest in the school. Do you have a super cute dorm room? Send us a photo, or upload one to our Facebook page, we would love to see your fabulous dorm decor style! I ordered from you about two years ago and need to re order what I purchased. My address was pob 864 bonsall, ca 92003 what did I order? Hi Jeannee Thanks for reaching out! We sent your inquiry to our Customer Service department so that they can look into the order archives and try to find yours. You can also call us for assistance at 1-800-366-1700. Best of luck with your decor project and Happy Holidays! Interested in the frames for a dorm room. How do you use the photos? just double stick tape them inside the frames? 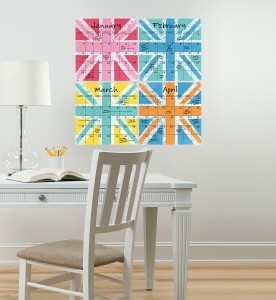 Where may I purchase large vinyl wall pops that I may write on with a dry erase pen? Hi Mrs. Harrison – we think we already applied to you through our website contact form. However, just in case, no, unfortunately we do not sell mixed packs of the colored dry-erase dots. Our store locator tool will help you find retailers in your area, but not all stores carry all products. Usually they can special order anything from our catalog for you, though. Best of luck with your classroom decor project!